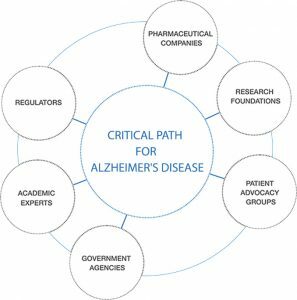 The Critical Path For Alzheimer’s Disease (CPAD) is a public-private partnership aimed at creating new tools and methods that can be applied to increase the efficiency of the development process of new treatments for Alzheimer disease (AD) and related neurodegenerative disorders with impaired cognition and function. Alzheimer disease (AD), the most common and devastating form of dementia globally. In August 2018, CPAD (rebranded in January 2018) is celebrating the 10th Anniversary of the original formation of the Coalition Against Major Diseases (CAMD), the name of the founding consortium. CPAD’s mission is to accelerate the drug development process for patients with chronic neurodegenerative disease leading to dementia. Our primary focus is on AD. CPAD works with industry, regulatory authorities, and patient advocacy organizations to advance Drug Development Tools (DDTs) for evaluating drug efficacy and safety, to optimize novel clinical trial designs, and aggregating anonymized patient-level data using CDISC consensus standards to facilitate the regulatory review process. imaging, and digital/biosensor observational- and performance-based], (2) development of CDISC data standards for AD endpoint assessments, (3) creation of integrated databases for observational and clinical trials data, and (4) development of quantitative model-based tools for drug development. 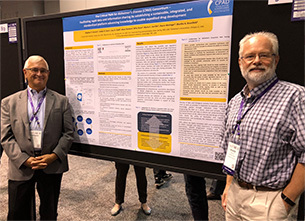 Key milestones for CPAD include the first-ever qualification opinion by the EMA for the use of low baseline hippocampal volume for patient enrichment in pre-dementia trials (2011), the development and publication of the first-ever CDISC (Clinical Data Interchange Standards Consortium) therapeutic area data standard for AD, v1.0 in 2011 (v2.0 updated in 2013), the first-ever drug-disease trial model and clinical trial simulation tool endorsed by FDA and qualified by EMA (for mild and moderate AD; 2013), the launch (2013) of the first and largest (2015) open database of aggregated CDISC-standardized clinical trial data for Alzheimer disease (6,500 patients and 24 clinical trials), FDA Letters of Support to the consortium encouraging the further study and use of cerebrospinal fluid (CSF) analytes Aβ 1-42 , Total-Tau, and Phospho-Tau, and low baseline hippocampal volume (HV) measured by magnetic resonance imaging (MRI) as exploratory prognostic biomarkers for enrichment in trials for AD; inclusion of biomarkers (Tau PET and CSF neurogranin) in the response to the Federal Register Request notification “Identifying Potential Biomarkers for Qualification and Describing Contexts-of-Use to Address Areas Important to Drug Development,” FDA-2014-N-2187-0029 (2015), and acceptance (2016) of a Statistical Modeling Plan for the use of intracranial volume-adjusted volumetric hippocampal volume with MRI (ICV-vMRI) as a prognostic biomarker for inclusion in amnestic MCI studies. Until 2015, CPAD focused on projects that spanned AD and Parkinson disease (PD). In October 2015, a newly formed consortium, the Critical Path for Parkinson’s (CPP) consortium, assumed work on PD-related projects, allowing for CPAD to focus on AD.